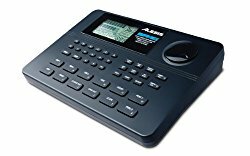 Alesis DM6 Review – Is It Worth The Money? A bit outdated in comparison with newer Alesis models. No learning mode for new drummers. The Alesis DM6 has been on the market for many years now and it has served as one of the best-selling budget electronic drum sets. 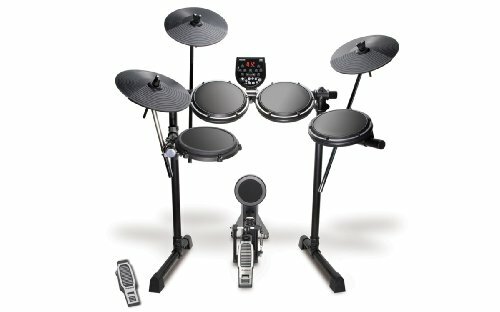 It is still competitive in many aspects of electronic drumming if you’re looking for an entry level kit. Note: Newer Versions Available. The Alesis Nitro and Alesis Nitro Mesh kits. Be sure to check out our reviews of those if you’re looking to buy a new set online. The Alesis Nitro has 385 cymbal, drum and percussion sounds. 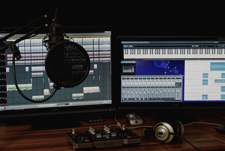 This large quantity of sounds is paired with 40 pre-made kits altogether. The Alesis Nitro also comes with a learning mode within its module. In comparison with the Alesis DM6 kit, this is a significant advancement, especially for the newbies in the world of drumming. 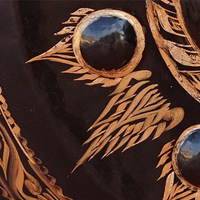 You can either choose to drum along to one of the drumming patterns in the module or add a pattern of your own. The module also tracks your accuracy and improvement. The Alesis Nitro Mesh set shares almost most of the features and elements with the Nitro kit, expect with updated mesh drum heads. These elements provide a more dynamic and realistic drumming feel than rubber pads. 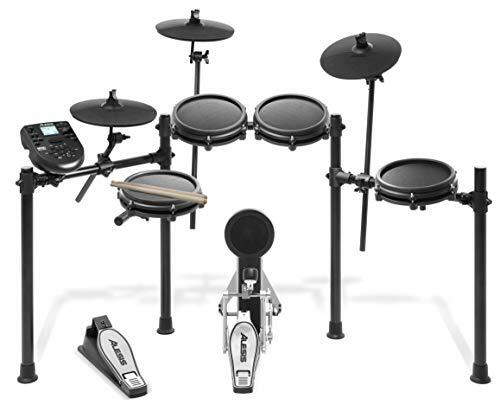 The DM6 drum set contains 8 drum pads altogether. There are three 8’’-single-zone tom drums, three 12’’-cymbal pads, one kick pad, and one dual-zone snare. The latter supports both rim hits and regular sounds. What’s important to mention here is that this set also comes with a bass drum pedal, hi-hat pedal, and a pair of low-budget sticks. While the former will meet most of your drumming needs, the sticks aren’t the brightest stars in the drumming sky. 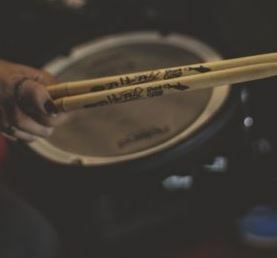 You might need a better pair of drumsticks, so read more about some better sticks here. 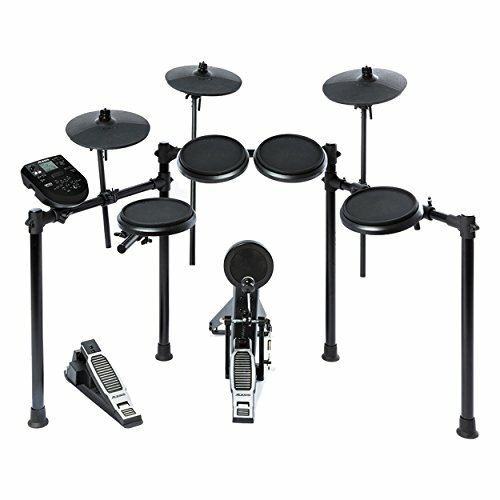 The DM6 Alesis drum set also includes an AC adapter and a rack for the drum pads. The rack is made of aluminum, which is a great choice of the manufacturer because it’s easily carried to gigs and it holds all the elements in a safe way. This set generally does not come with a pair of headphones. If you don’t want your family or neighbors hear you playing the drums, you might want to get a pair of electronic drum headphones. The surfaces of the cymbals and pads provided by Alesis are natural, player-friendly pieces that ensure pleasant drumming feel. Also, thanks to the realistic vibrations you get when you play this kit, you can reach good natural dynamics. This is important for people who have just started playing the drums. Since some electronic drums might sound artificial and confuse beginners, it’s important to start playing the drums with a realistic set. The DM6 offers good value for money in this regard. The DM6 module is quite a good one for the price, which contains a plethora of pre-recorded drum kits. In line with that, drummers can count as much as 108 great cymbal, drum, and percussion ready-made sounds. The biggest drawback of the DM6 is that it contains only rubber heads. This is quite expected for such an entry-level kit, but newer entry-level sets are now coming with the option of mesh heads, which can be quite a big advantage in terms of expression and realism of playing. The tones you play are sent out in form of MIDI-signal, which is pretty useful if you want to use your DM6 to generate drum tones for a MIDI interface. The kit contains a USB connection, which can transfer the MIDI information. The module does not contain standard 5-pin MIDI connections. 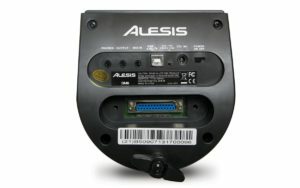 You can connect this Alesis kit to your PC or smartphone via MIDI connection through the USB cable and experiment more with the elements of drum production. Also, the DM6 can be connected with different players, so that you can play this electronic set along with your preferred songs. If you’re a more experienced drummer or simply want to spice up your drumming practice, you might want to add another pedal to the drum bass. The Alesis DM6 supports such an appendix. It is technically possible to extend the kit to simulate double bass pedals. If your physical double bass drum pedals don’t fit on the stock bass drum pad with the kit, you can replace your kick drum pad with a bigger one. If you’re looking to use 2 pads, there is no option to directly extend your set-up to include a separate 2nd bass drum pad input. However, a splitter can be used to separate the line into 2 separate pads. Alternatively, you can use the hi-hat pedal as the other bass drum pedal, but it won’t feel as natural as using a kick drum pedal. You need either a set of headphones or an amplifier in order to hear the Alesis DM6 kit. It has separate outputs for each. Please keep in mind that the main output is a small 1/8” connection. 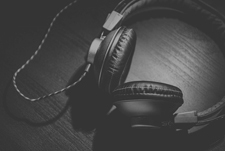 If you want to connect to an amplifier that use standard 1/4″ cables (the ones that look like guitar cables), you may need to purchase a 1/8” to 1/4″ converter. If you are looking for a drum amp, check out our article on electronic drum amplifiers to find out what’s the best choice for you. 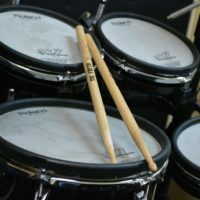 Keep in mind that if you’re using the electronic drum sets for bigger gigs, then this would generally be connected to a PA system instead of a drum amp. The output from the DM6 module could just be connected to the main mixer. 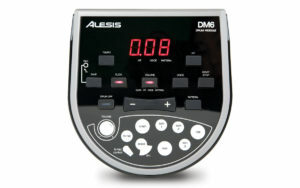 A decent electronic drum set, the Alesis DM6 is a fine value for money. It’s a reasonable choice for drumming beginners, and a nice option for seasoned drummers. If you can still get your hands on one of these, then they can make for a nice entry-level kit. However, if you’d still like to treat yourself to an updated electronic set with more options, the Alesis Nitro Mesh Kit would be a better choice. 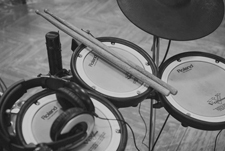 The 3 Best Cheap Electric Drum Sets for Beginners – Cut Through the Junk!